This entry was posted in Books, Fun & Friends and tagged Anne of Green Gables, Bible, Books, Choose Your Own Adventure, Fun & Friends, Grandma, Happy, L.M. Montgomery, Old Photos, Reading, Writer, Writing. Bookmark the permalink. This is such a beautiful post, Michelle! It would be so fun to see everything I’ve read … every time I come across a random snippet from an old journal that mentions what I was reading at the time it’s such a treasure. I love the picture you included and the story about your grandparents 🙂 I can totally relate. Thank you for brightening my day! I’m looking forward to following your blog! Thank you, Emily! Sometimes I find a photo that brings wonderful memories to mind, I’m so lucky to share them! Best wishes to you! Aw, I did a double take here. This looks so much like my backyard when I was a little kid! Oh my goodness! 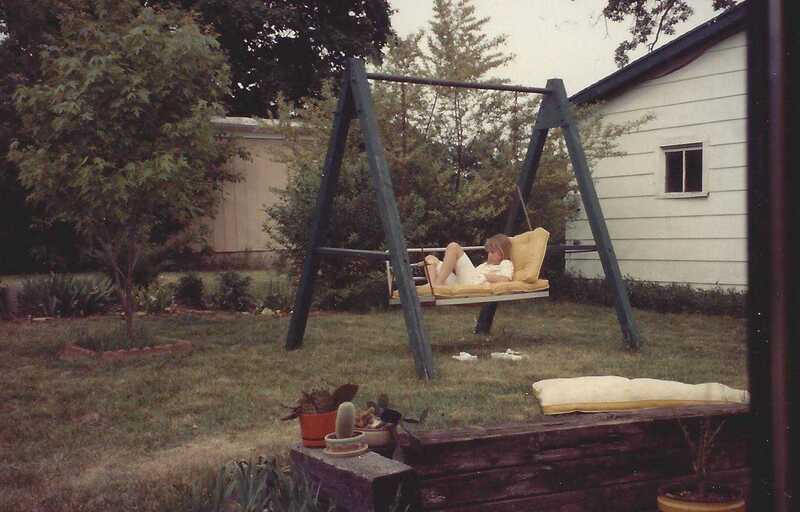 Hope you had a few reading adventures (and just good fun) in your backyard like I did! Awesome! You know, I might read it again yet! Wouldn’t it be fun to read that classic once more! What an excellent idea! Thank you!